1. No one else will be giving the gift recipient a present that looks like yours. You are telling the person getting the present that they are special. They are worth the time and effort you took to make the gift as pretty on the outside as the thought you took buying the gift itself. 2. Making your own gift wrap is a chance not only to save money but help the environment by recycling or repurposing products. You could use altered versions of newspaper, freezer paper or even leftover gift wrap in a creative way that is eco-friendly and less wasteful. 3. Making your own gift wrap is great for last minute presents. Use whatever craft supplies you have on hand and repurpose them in imaginative ways. You will be amazed just how creative you can be when under pressure! 4. Last but not least, it is fun! We creative types just can't help ourselves . We have to add a crafty touch to everything! It is in our nature. Here are some examples that might inspire you to get creative with the gifts you plan to wrap and give to the special people in your life! Bring ordinary wrapping paper up a notch with craft paints and stencils. Plain old paper will look ever so fancy when you add some creative designs. Use metallic stencil paint as shown in the photo, to change your project from boring to extraordinary. Who says that pretty gift bags are only available at the store. These were made from ordinary craft paper, paint, ribbon and a heart punched out of red paper. I think the results are dazzling! These wrapped presents have got to be the most innovative I have seen in a long, long time. The wrapped boxes look like fruit! So cute! Gifts that are wrapped like a strawberry, kiwi, pineapple, orange and watermelon are available in the tutorial. Brittany Watson Jepsen provides links to free fruit printable downloads and easy to follow inspirational photos. You cannot go wrong with this paper craft! These beautifully wrapped gifts are an example of what can be done when you are in a hurry. The three examples are wrapped with ordinary papers that most crafters have on hand ( brown kraft paper and white freezer or meat wrapping paper). The presents are then decorated with washi tape! Almost every one has washi tape in their paper craft supply collections. Add a silk flower and printed tag and you have a beautifully wrapped gift that looks like you took a lot of time and effort making it look special! Clare Le Roy's inspirational blog post shows us how to make an ordinary kraft paper wrapped package look extraordinary. She features five examples that demonstrate just how easy it is to make a beautifully wrapped gift with simple embellishments. 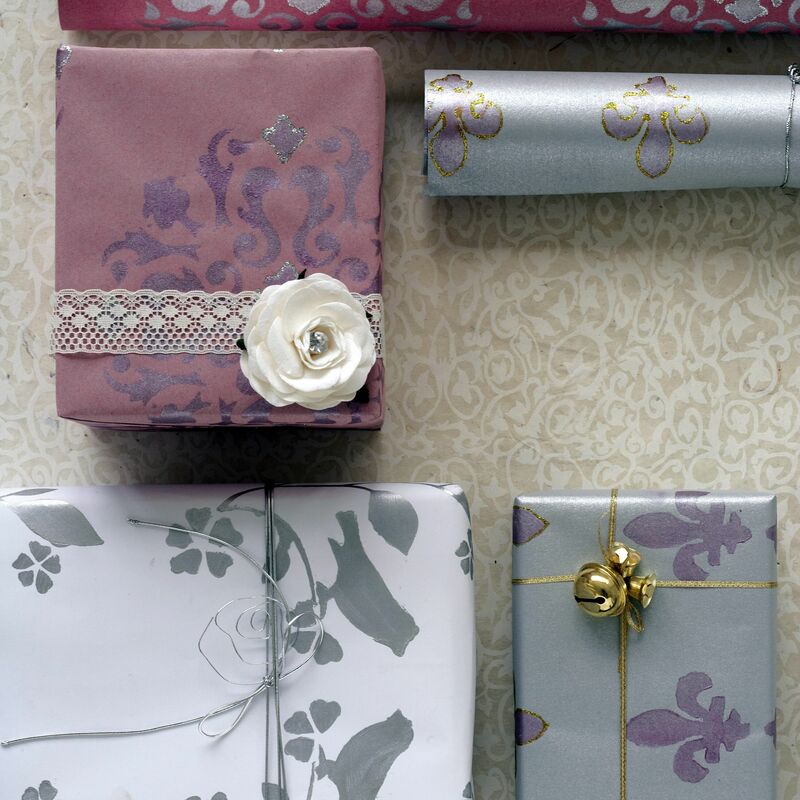 These techniques don't take much time, but add a beautiful and trendy look to your gifts. This gift wrapping tip is an example of quick, easy and eco-friendly gift wrap. Wrap your gift with some white food wrap or mailing paper that you have on hand. Draw some cute flowers with a marker onto the wrapped present. Punch out some colorful paper circles plus two butterflies and glue onto the flowers. Add a pretty ribbon and voila! You have a uniquely wrapped gift that tells the recipient they are special!